We’d love your help. Let us know what’s wrong with this preview of Hello, Friends! by Jerry Howarth. For 36 years, Jerry Howarth ushered in eternal hope each spring and thrived in the drive of each fall as the voice of the Toronto Blue Jays. In 1982, the lifelong avid sports fan joined Tom Cheek as full-time play-by-play radio announcer for the Blue Jays, and An honest memoir about life, family, and baseball from the longtime, legendary Toronto Blue Jays radio broadcaster. For 36 years, Jerry Howarth ushered in eternal hope each spring and thrived in the drive of each fall as the voice of the Toronto Blue Jays. In 1982, the lifelong avid sports fan joined Tom Cheek as full-time play-by-play radio announcer for the Blue Jays, and for the next 23 years, "Tom and Jerry" were the voices of the franchise. Jerry became part of the fabric of a nation and a team, covering historic moments like the rise of the Blue Jays through the 1980s that culminated in back-to-back World Series Championships in 1992 and 1993. His Hall of Fame-worthy broadcasting career has been nothing short of legendary. When Jerry retired in February 2018, the tributes poured in and made one thing perfectly clear: Toronto baseball would never be the same. To ask other readers questions about Hello, Friends!, please sign up. Be the first to ask a question about Hello, Friends! When a broadcaster does the games for one team for a long time, that person will have a vast collection of stories to share. That is the case for Jerry Howarth, who was a radio broadcaster for the Toronto Blue Jays from 1982 to 2017. He shares many of those stories and some about himself as well in this memoir. As one might imagine, a person who has had the same job for 36 years will have a wide variety of stories to tell. Of course, he shares his recollections on famous moments in Blue Jays hist When a broadcaster does the games for one team for a long time, that person will have a vast collection of stories to share. That is the case for Jerry Howarth, who was a radio broadcaster for the Toronto Blue Jays from 1982 to 2017. He shares many of those stories and some about himself as well in this memoir. As one might imagine, a person who has had the same job for 36 years will have a wide variety of stories to tell. Of course, he shares his recollections on famous moments in Blue Jays history, such as Joe Carter’s walk-off home run to win the 1993 World Series and the famous bat flip by Jose Bautista in the 2015 American League Division Series against the Texas Rangers. However, what makes the book a little different from other collections of stories like this are all the personal connections Howarth had with so many Blue Jays players and personnel over the years. Some of these stories will be sad, such as the death of Howarth’s long time broadcast partner, Tom Cheek. His telling of the last half inning Cheek called for the Blue Jays will make the toughest of readers generate at least a sniffle. But many, many more of them are uplifting and tell about the successes and positive accomplishments of the subject, especially if it was a player. Howarth rarely has a bad thing to say about anyone in this book. The most interesting part of the book turned out to be the beginning as he tells his tale of how he sent tapes of college games he broadcast and his jobs in sports outside of broadcasting. He worked for a few years for the Utah Jazz before starting his broadcasting career doing the games of the AAA Tacoma Twins. While this read much like any other memoir, it was good material and advice for readers who may wish to pursue this profession. The rest of the book with its storytelling is much like any other collection of stories, fictional as well as non-fictional – some good, some not so good (either very short or just telling the reader “Hey, I talked once to so-and-so). Overall, this book is one that Blue Jays fans will certainly enjoy and fans of other teams may like as well. If nothing else, Howarth can say he has shared a treasure trove of stories that many generations of Blue Jays fans will pass along from generation to generation. I wish to thank ECW Press for providing a copy of the book via NetGalley in exchange for an honest review. I am a recent convert to baseball - and, in particular, the Toronto Blue Jays - so I was very interested to have a read of this book. A memoir of Jerry Howarth, the man who spent 36 years being the voice of the Toronto Blue Jays on the radio, this book is a pretty standard biography - where he grew up, how he got involved in radio, famous names, memorable events etc. It was fascinating reading for a newbie, with lots of information I hadn't known previously. But I am not sure how interesting it would be for a long-term die-hard fan. It could be just a little light on for depth. A well-known comedian/actor whose love of baseball is legendary included his impressions of some Yankees legends in one of his books. The guy loved Mickey Mantle, despite his flaws. He did not like Joe Dimaggio, because of his. Perhaps this was because he knew the former well enough to see past the negatives and could focus on his good points. The latter, his only encounters were negative ones. Jerry Howarth's new book, “Hello, Friends!” takes the approach that the aforementioned author took wit A well-known comedian/actor whose love of baseball is legendary included his impressions of some Yankees legends in one of his books. The guy loved Mickey Mantle, despite his flaws. He did not like Joe Dimaggio, because of his. Perhaps this was because he knew the former well enough to see past the negatives and could focus on his good points. The latter, his only encounters were negative ones. 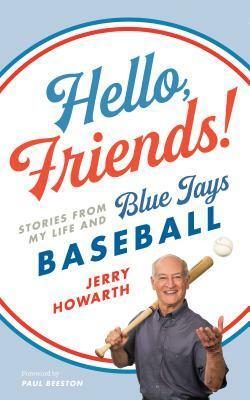 Jerry Howarth's new book, “Hello, Friends!” takes the approach that the aforementioned author took with Mr. Mantle – EVERYONE(*) must have some redeeming qualities. A brusque alcoholic? “Well, I hear he's getting treatment for his addiction and his anger management issues.” A manager lying about his military service history? “He's apologized and doesn't do that any more.” etc. etc. Mr. Howarth ALSO intermingles his own life story in between the tales of his encounters with the personalities of baseball and the games he has witnessed. Occasionally, the transition comes off a little awkward, but most of the time, working along a timeline, it makes perfect sense as to how / why the author switches his subject between “baseball” and “Howarth family life”. A decent read. The book may have been a bit more interesting had the author not constantly had to find the good in everyone he ever met – BUT, I have to admit, if I were involved in baseball, I wouldn't be sharing my stories with someone who was simply going to use them to skewer me in some tell-all book!! RATING: 3 1/2 Stars, rounded up to 4 Stars where partial stars are not permitted. Thanks for the ARC copy of this book from ECW Press.... This book is an In depth look on and off the field at the game of Baseball through the commentators and players points of view.....Jerry worked hard in the early stages of his Career by recording games, and then playing back commentary's on the tapes..
A good daily routine is essential for Jerry in Order to be a fine broadcastor, he broadcasts approx 162 games per season and before each game does a lot of preparation and research from his pl Thanks for the ARC copy of this book from ECW Press.... This book is an In depth look on and off the field at the game of Baseball through the commentators and players points of view.....Jerry worked hard in the early stages of his Career by recording games, and then playing back commentary's on the tapes..
Tom Henke is one of his fave Blue Jays he has 4 children one of who was born with Down's syndrome, every year he has a charity golf classic to raise money for Si learning centre. Carlos Delgardo was the only player to have an RBI Recordof 30 home runs in ten straight seasons. 1998 was the Blue Jays last full season at the Ex. 1992 Cito Gasto first African American manager to win that yrs series. 1994 Same year world series cancelled due to baseball srike Jerry became a Canadian Citizen with his family. One of the players Charlie O Brien having been hit several times in conventional mask by foul tips , this was enough for him to develop a new catchers mask, he worked in conjunction with Van Velden Mask Inc , Hamilton Ontario which was approved by MLB in 1996. Since 1997 Blue Jays wear Red uniforms on Canada day. VIP GUESTS IN RADIO BOOTH CONVERSATIONS WITH JERRY. Sometimes Wives/Girlfriend of players will promote Food Drives. "Next Pitch" Jerry uses these words almost daily to motivate himself . Jerry coached basketball for 25 yrs, 1n 2000, he was inducted into Sports Hall of Fame...2015 he was given the Order of St Michael from St Mike's High School. 2016 diagonosed with stage 1 prostate cancer. A special thank you to Edelweiss and ECW Press for an ARC in exchange for an honest review. Jerry Howarth has been the voice of the Toronto Blue Jays for 36 years. He has covered historic moments, like the rise of the Blue Jays through the 1980s that resulted in back-to-back World Series Championships in 1992 and 1993, and worked with the best in sports. His remarkable broadcasting career is legendary, evident in the tributes that poured in when he retired this past February. In this book, Howarth A special thank you to Edelweiss and ECW Press for an ARC in exchange for an honest review. In this book, Howarth brings together anecdotal stories about baseball, life, family, and work. Baseball fans will enjoy reading about pivotal players such as Dave Stieb, Duane Ward, Roberto Alomar, Joe Carter, the late Roy Halladay, and more recently, John Gibbons, Edwin Encarnacion, Josh Donaldson, and Canada's own Superman, Kevin Pillar. Jerry, you are a national treasure and Canadians are so grateful that you chose our country to call home. Congratulations on your broadcasting legacy and your well-deserved retirement. Your kindness, integrity, and impeccable work ethic are evident in these wonderful stories. Though now retired (2017), the long-time play-by-play voice for the Toronto Blue Jays still has much to say. Hello, Friends is a rambling collection of anecdotal shorts in which Jerry Howarth recollects many of the memorable people, places, and events that shaped his life and career. Born in York, Pennsylvania, Howarth recounts his circuitous route through childhood, teenage, and young adult years to what became a 36-year radio career with the club. Honest and forthcoming, Howarth pens what should be, could be, a fascinating story. Unfortunately, I found much of that potential lost in a struggle to make connections, to immerse myself in the sight, sounds, scent, and the ever-important need to emotionally connect with Howarth’s journey. Jerry Howarth is a former sportscaster. He was born in the U.S. and became a Canadian citizen in 1994. He is best known as the radio play-by-play voice of the Toronto Blue Jays from 1981 through the 2017 season. Howarth started his career in Toronto where he worked part of the 1981 Blue Jays season as a commentator. In 1982, he joined Tom Cheek as his full-time play-by-play partner. For the next 23 years, "Tom and Jerry" would be the radio voices of the Blue Jays (Cheek passed away in 2005). Howar Jerry Howarth is a former sportscaster. He was born in the U.S. and became a Canadian citizen in 1994. He is best known as the radio play-by-play voice of the Toronto Blue Jays from 1981 through the 2017 season. Howarth had been diagnosed with prostate cancer in 2016 and had surgery to remove a small tumor. He retired from broadcasting in February 2018 due to health reasons. This book is Howarth's story of his life. He starts off by telling us about his childhood and education. It was interesting to learn that he had gone to university to study law but his love of sports was so great that he quit school to give broadcasting a try. Obviously it has worked out for him! He shares stories of the Toronto Blue Jays and managers who have been on the team over the years right up to today's line-up including Dave Stieb, Jack Morris, Duane Ward, Roberto Alomar, Joe Carter, John Gibbons, Edwin Encarnacion, Josh Donaldson and the late Roy Halladay. He also shares stories about players and managers from other teams. If you are a baseball fan, you'll like this book. If you are a big-time Blue Jays fan, you'll probably love it. I liked it as it was interesting and nice to hear about the various players from Howarth's personal experience and friendships. This book is great for people who love baseball and the Blue Jays. There were many stories from Howarth's early childhood through his retirement. His stories from his days as a major league broadcaster are not only about Blue Jays players, but players from other teams as well so don’t think this book is only about the Jays. Howarth's unique stories really showcase what the league is really like, how the players are behind the scenes, and interesting statistics about the players and the league it This book is great for people who love baseball and the Blue Jays. There were many stories from Howarth's early childhood through his retirement. His stories from his days as a major league broadcaster are not only about Blue Jays players, but players from other teams as well so don’t think this book is only about the Jays. Howarth's unique stories really showcase what the league is really like, how the players are behind the scenes, and interesting statistics about the players and the league itself. I personally found the stories about the players and their lives rather fascinating. Blue Jays baseball on the radio and Tom And Jerry are the fabric of my early days as a baseball fan. Tom and Jerry taught me the game that I really knew nothing about when I started watching around 1989. My hope for this book was a warm, heart warming story of the the man behind the mic since the 80s. One of a handful that has seen the good, bad and ugly of the Toronto Blue Jays. What the book was, was a chronicle of Jerry Howarth’s time with the Blue Jays and small, intimate snippets of the pla Blue Jays baseball on the radio and Tom And Jerry are the fabric of my early days as a baseball fan. Tom and Jerry taught me the game that I really knew nothing about when I started watching around 1989. My hope for this book was a warm, heart warming story of the the man behind the mic since the 80s. One of a handful that has seen the good, bad and ugly of the Toronto Blue Jays. What the book was, was a chronicle of Jerry Howarth’s time with the Blue Jays and small, intimate snippets of the players and personnel that made the team who and what it was through the years. The peek behind the curtain that I had hoped for wasn’t there but some fond memories of years and names gone by were. If you’ve been a fan of baseball and particularly the Blue Jays, this one is one for your collection and it’s great for a walk down memory lane as the days turn from spring to summer. Hello Friends! is a great book for baseball fans, especially fans of the Blue Jays. It is also an inspirational story for people thinking of a career in sports broadcasting. Jerry included interesting facts about his life and how he got his start in sports broadcasting and found his own style. I was surprised to find out that he attended law school and was in the military. He also has many behind-the-scenes stories of players, managers, coaches and baseball executives. I enjoyed the personal sto Hello Friends! is a great book for baseball fans, especially fans of the Blue Jays. It is also an inspirational story for people thinking of a career in sports broadcasting. He also has many behind-the-scenes stories of players, managers, coaches and baseball executives. I enjoyed the personal stories of the Jays players and the team’s journey from a new franchise to winning the World Series in ’92 and ’93. Thanks ECW Press for a copy of Hello Friends!. Some good stories and tidbits. It pains to me say, though -- this book needed a good edit. There were so many clunky and awkward sentences, along with some basic errors (there's no such place as St. John, N.B.). It was also a bit repetitive and disorganized. I enjoyed it, but tripping over the writing itself was distracting. Update: Having since heard Jerry speak and tell a few stories from Hello, Friends!, it definitely works better out loud.